to practice the skill in a fun way. Basically, the idea was for children to pick a Bible verse that would refute one of the six false statements I had written in circles on an 8 x 4 foot space. 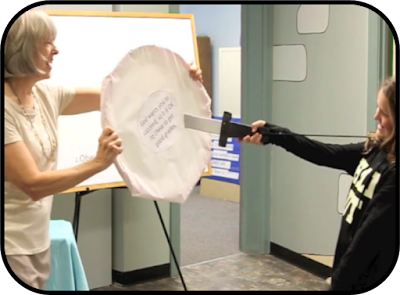 The scriptures were on swords, so they had the promise of using the sword if they could pick the right one. It took thinking to choose the right Bible verse, not something kids like to do today! But the reward for figuring it out (getting to stab the sword through the paper target) turned out to be a great motivator. Who doesn’t enjoy doing something like that?! I chose my 6 false statements and the 6 Bible verses to refute the statements. Rigid swords: The swords were given to us for decoration, but they were perfect for this game. You want a sword that will be rigid enough to pierce your paper target. 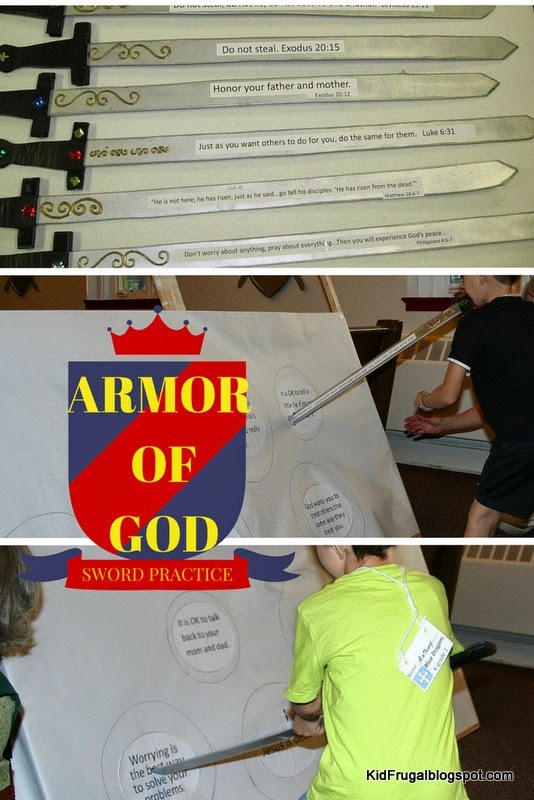 Bible verses for the swords: I printed the verses up as large as I could so they could be seen easily. If you use my PDF, you can print pages 1 and 2 and then match them up end to end and tape them BEFORE you cut them apart. That will make the long verses you see in the picture. Page 3 contains its entire verse. Target: I printed this PDF and then cut the circles out and pasted them onto an 8’ x 4’ length of butcher paper. I stretched the paper across a framework I made out of 2 empty bulletin board frames. You could also stretch the paper across a door, over hula hoops or any rigid structure that has open space behind it. That was it. I made up three separate butcher paper targets since I had three classes coming through. I put one up at a time, and had the teens help me take it down and put a new one up between classes. The targets stayed in pretty good shape, so it was possible for more than 6 kids per class to do this activity. 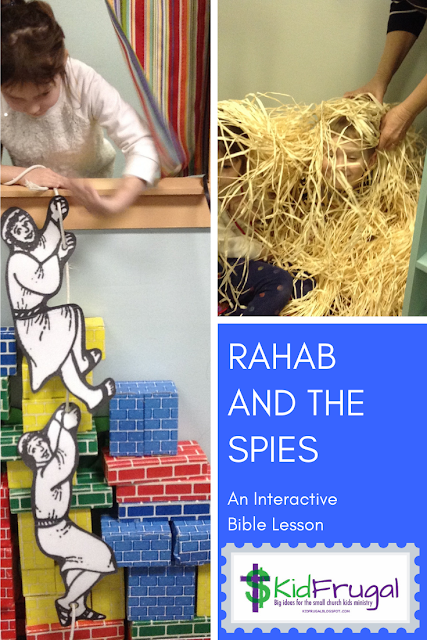 We used this activity after hearing the story of Jesus’ temptation in the desert. Just as Jesus used Scripture to defeat the devil, we learned how to apply God’s word when confronted with wrong ideas. I have since used this ideas with hula hoops for the targets.